If we mere survivors of life are experiencing all these conceptual difficulties with the whiteness of Christmas, think how much more complicated the situation must be for the wretches charged with actually visualising it for us: our ­artists. On top of the conceptual issues they have to face, artists, the poor souls, need also to overcome a daunting array of artistic obstacles. Which is why so many of them have chosen not to. The single most remarkable thing about snow in art is how few great painters have tackled it. For instance, right now, at the Royal Academy, there’s a show devoted to three of Britain’s finest landscape artists — ­Constable, Gainsborough and Turner. It’s a petite selection, but representative enough. How many snow scenes does it include? None. Why? Because Constable never painted a snow scene. Neither did Gainsborough. As for Turner, on the few occasions when he did venture out in winter, there was usually such a terrifying storm a-blowing, you can hardly make out any weather at all, snow or otherwise. The Tate’s great Turner, Hannibal and His Army Crossing the Alps, is supposed to show a snowstorm thundering down on Hannibal and his elephants. But the mad vortex Turner has come up with could just as easily describe a tropical storm, a typhoon, a hurricane or even, at a push, a tidal wave. It’s the climatic fury that counts with Turner, not the invisible snow. Poussin never painted snow. Nor did Claude, Rubens, Rembrandt or Velazquez. There’s no snow in Canaletto. No medieval snow. No gothic snow. No snow in all the years of rococo. The entire Enlightenment was enlightened enough to avoid it. Why? Some of this stubborn censorship of the snowflake was due to the physical ­difficulty of painting in winter. Holding a brush in the cold is a trial. Capturing the subtle effects of competing whites with frozen fingers is horribly demanding. And you can’t paint subtle landscapes in thick fur gloves. Even Van Gogh, who was as tough and determined an outdoor landscapist as art has seen, and who was notorious for traipsing everywhere and anywhere to get his effects, has left behind only a few scrappy snow scenes, most of which were done early in his career in his home town, Nuenen. They’re stark and dark, freighted with heavy ­family psychology, as if the harsh mid­winter were the only place he could go to escape from home. Poor Vincent. One of the main reasons he left Paris for the south of France was to get away from the winter weather. Yet what should greet him when he stepped off the train in Arles? Eighteen inches of snow — the heaviest snowfall on record in Provençal meteorology. He made a half-hearted effort to paint it, but it is no ­coincidence that the first great works Van Gogh produced in Arles were not painted until the snow melted and the cherry ­blossom began to show. Technically, painting snow is notoriously challenging. It’s never a question of slapping on some white. Whiteness in art has huge chromatic implications. Which is why the best and most determined painters of snow were the impressionists, who made a point of understanding the complex colour issues that are involved. When I made my series about impressionism for the BBC, I had a determined go at understanding the particular problems that snow painters face. In my view, Pissarro was the finest painter of snow there has been. To copy what he did, I put myself in a snowdrift in Sweden, in temperatures of -28C, and attempted an optical experiment that was supposed to explain why ­shadows in snow are purple. After two minutes, I had to pack it in. My fingers were freezing, my ears were falling off, and the purple shadows had begun to swirl ­psychedelically and form themselves into sensuous art nouveau tendrils. I’m an art critic, get me out of here, I howled into the harsh white ­wilderness closing in on me. Of course, the most obvious reason why snow was so rarely painted is that the artists involved had never seen any. Italy is a marvellous country in which to have a Renaissance, and Rome is thoroughly deserving of its reputation as the fount of civilisation, but they don’t see a lot of white Christmases in the Vatican. Michelangelo, Leonardo and Raphael were unlikely to have done much sledging. It wasn’t until the Renaissance began creeping northwards across the Alps, into the frozen stretches of Europe, that the paintbrush finally fell into the hands of artists who knew a lot about snow. That marvellous gallery attached to Buckingham Palace, the Queen’s Gallery, where fine chunks of the royal collection are always on display, is currently showing a selection of pictures drawn from the royal hoard of northern Renaissance art. So we’re looking here at work by German, Dutch, Flemish and French artists. It’s a dazzling event, certainly worth a seasonal detour. Most Christmas visitors will make a beeline for the Holbeins and the Dürers, which is perfectly under­standable, because both artists make spectacular contributions to the show. For me, though, the single most intriguing picture in this ­display is tucked away at the back in the final room. 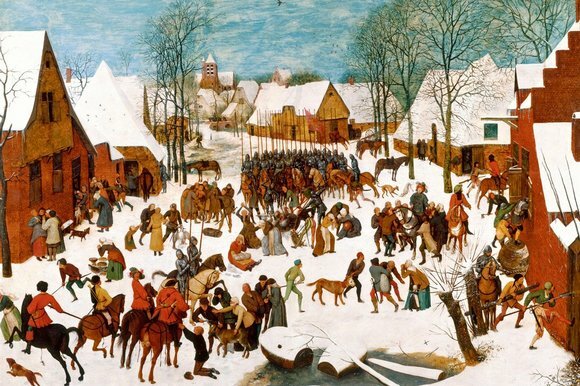 It’s a snow scene: Massacre of the Innocents, by Pieter Bruegel the Elder. This extraordinary image was acquired by Charles II after the Restoration. Painted by Bruegel in 1565, it originally depicted one of the Bible’s darkest moments: the killing of every male child in Bethlehem on the express orders of King Herod. So it’s a Christmas scene. I hope you haven’t ­forgotten the story. The three Wise Men have told Herod that a new king of the Jews has been born in Bethlehem. But they won’t tell him where. So Herod gives the order for every male child in Bethlehem under the age of two to be murdered. And that’s what Bruegel originally showed us. Hang on a moment, though. Look closely at the picture today and you won’t find any innocents being massacred. Where have the dead babies gone? Where’s the blood, the viscera, the gore? I’m afraid it’s all hidden under that delightfully painted snow. Soon after it was ­finished, Massacre of the Innocents was bought by the Holy Roman Emperor Rudolf II, and it was Rudolf who decided that the events depicted were too ghastly for him, and too easily mistakeable for actual events in his empire. So he had the massacred innocents painted out. See the old woman on the left crying over some loaves of bread in the snow? Those loaves were originally dead babies. See the calf by the barrel in the foreground, having its throat slit? That was originally a baby. See the wild boar being lanced just below the group of mounted soldiers? That was a baby. Every bundle ­carried by every wailing mother was ­ori­ginally a baby. See the dead swan that a soldier is carrying by the neck, above the two soldiers in red? That was a baby. Thus, all this crisp white snow, which Bruegel has painted so prettily, and which makes all the other colours in the picture sing so vibrantly, is proving to be an excellent cover for tons and tons of unimaginable evil. Merry Christmas. And let’s hope it doesn’t snow.